As finals week begins, stress levels rise to an all-time high while time to relieve that stress is at an all-time low. Wouldn’t it be nice if you could simultaneously study and ease tension without losing precious time? 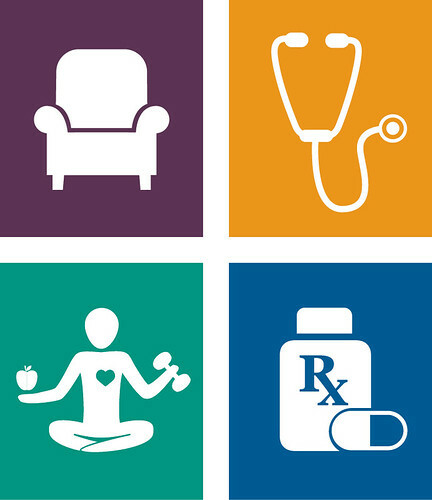 This week, the IMU Wellness Center will offer stress-reducing scents in its Zen Room. 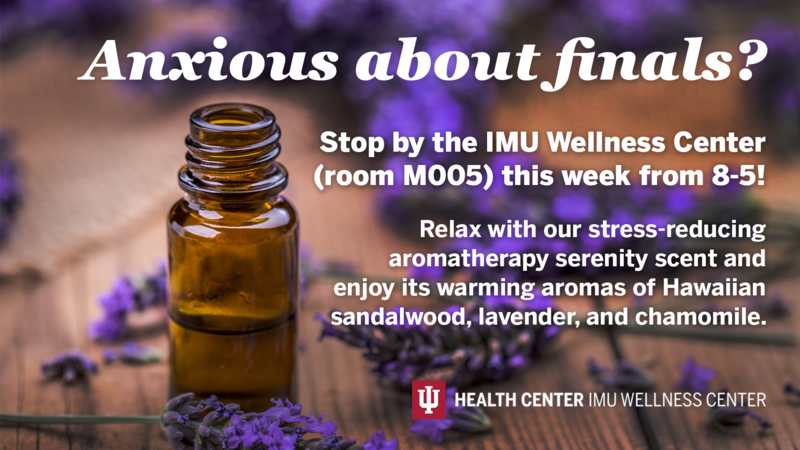 Visit room M005, breathe in, and prepare for finals with the help of some aromatherapy and relaxing music. Our essential oil “serenity” scent is a warming, floral blend of lavender, chamomile, and Hawaiian sandalwood, proven to reduce tension and calm emotions. Looking for other ways to relax? Try these! Laugh: Take a few minutes to watch a funny YouTube video, listen to a comedy podcast, or watch one (and we mean ONE) episode of a show that makes you laugh. Exercise: You might roll your eyes because of how often you hear this one, but it WORKS! Get up and take a walk around the library, schedule time into your finals week game plan for the gym, or dance to some iPhone tunes when you start to lose focus–the options are endless! Stretch: Stretching promotes circulation and increases blood flow to the brain and muscles. Think positive: No one ever got anywhere by saying “I can’t.” Write positive notes on post-its and stick them on your mirror, or change your phone’s home screen to an inspiring message. Sleep: We know time is precious, but your time will be much better spent if you get some sleep. Any sleep is better than no sleep! Color: Put a few coloring pages in your backpack! Coloring can help you focus and relax! Struggling with finals mid-week? 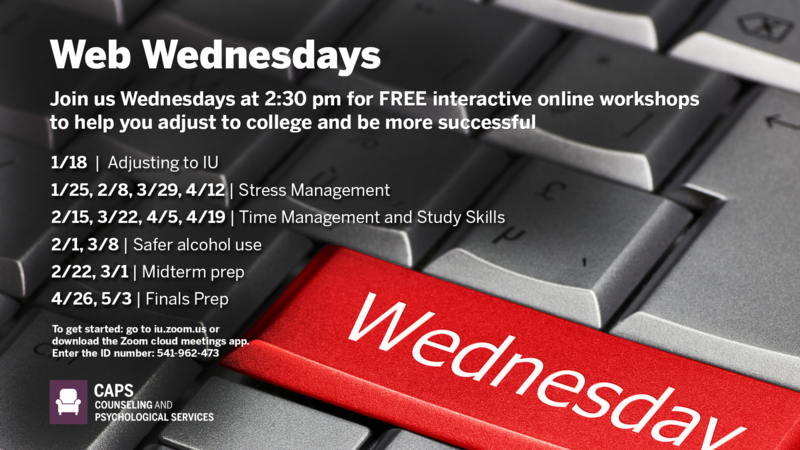 Join in our Web Wednesday Finals Prep workshop, wherever you’re at! Just log on to iu.zoom.us or download the Zoom cloud meetings app on your phone. Enter the ID 541-962-473 to get started!